These days I love to repeat that I have “one job and one hobby”. The job is based in an English Garden near Fukuoka, in southern Japan; the hobby consists of the parallel investigation into Japanese flora and gardens. Thus, while all my blood-toil-tears-and-sweat is sacrificed to the roses (which in so many countries outside England, Japan no exception, still remain the very and only hallmark of English gardening), my fascination sometimes wanders elsewhere, enticed by the indigenous colours and fragrances. By the end of May for example, when the blooms of roses reward the efforts and heal the senses of the gardener, part of my soul strived for a more exotic disorientation. I happened to ask myself: what would be the floristic counterpart of the imperial roses in the vernacular Japanese gardens? When the early spring revival is extinguished and the summer is awaiting the boiling-off of the rainy season to draw its colourful curtain, there is somehow a vacancy of flowers in the garden. One might say this is not a coincidental phenomenology. The entire scene must be for the roses. Leading ladies don’t admit eyes to linger elsewhere. As we all know, in the educated botanical language azaleas respond to the name of Rhododendron. (Incidentally, the etymology of that name validates my theory, as Rhododendron means “rose tree” in ancient Greek). Rhododendron is a vast genus remarkably concentrated in a relatively small area. Of about 1000 species, 700 are massed in the eastern Himalayan region, in the area where the great rivers of Eastern Asia break through the great mountain chain. Next in order, the Indochinese Peninsula offers the greatest diversity, and good representations are recorded in Korea and Taiwan too. The Japanese archipelago is home of somewhat 41 species and several forms and subspecies, with several endemisms (Ohwi, 1965). As seen for so many other exquisite trees and shrubs, China is honoured with an unmatchable garland of rhododendron flowers. The figure is 571 species, 409 endemic (eFloras.org, 2017). However, if we turn for a moment to local Chinese horticulture, some rather unexpected facts are offered to us. In addition, when mapping the distribution of azaleas throughout Asia, it appears that the representation of azalea types in China is proportionally limited in respect to Japan and Taiwan. Small surprise that, among the chief four species in the breeding of azaleas (R. simsii, R. indicum, R. kaempferi and R. kiusianum), only R. simsii is native to China. The rest have Japanese origins. The majority of the evergreen garden azaleas (or “persistent”, an adjective that I prefer here, considering their ubiquity in both eastern and western gardens and landscape) have been obtained in Japan. The richness of volcanic soil and marked absence of limestone throughout the archipelago are much favoured factors to ericaceous plants, which find here a remarkable representation. 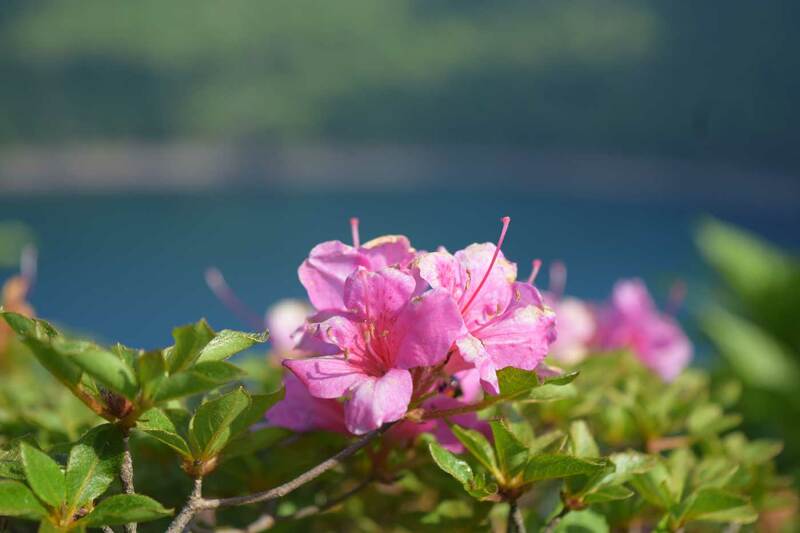 Azalea types grow everywhere in Japan – from subarctic Hokkaido to tropical Okinawa – but the southern isle of Kyushu is the indisputable epicenter of distribution. 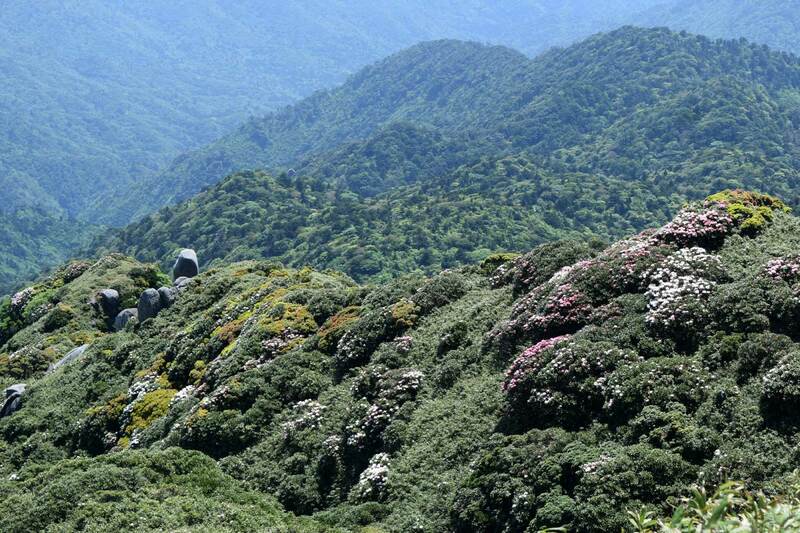 Travelling throughout Kyushu in spring, the blossoms of these azaleas never out of sight, growing in the mountains, gardens, parks and temple grounds. The Japanese nurserymen use two names for referring to the garden’s azaleas: tsutsuji and satsuki. In the two weekends between May and June I decided to botanize the natural areas of distribution of their parent species. 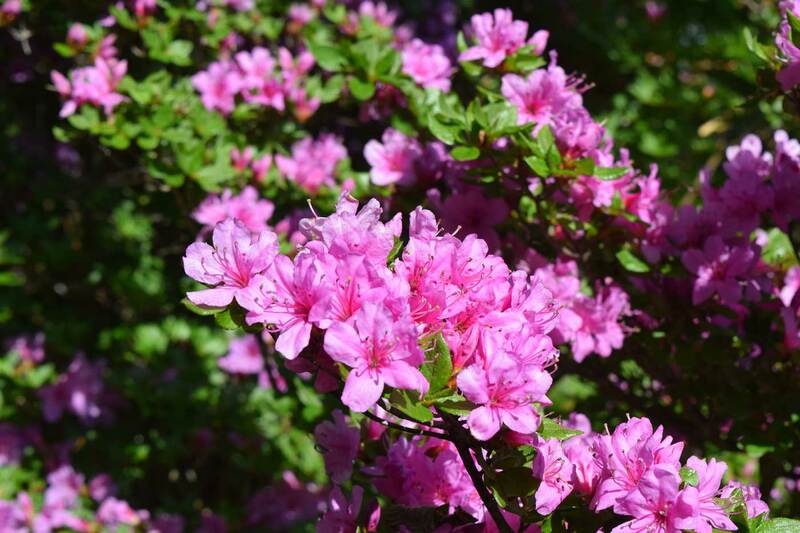 The tsutsuji azaleas are the first to adorn the Japanese gardens. In May and April they literally cover themselves in flowers, ranging from brick to dark red, from peach to white. Compared to the satsuki types, these azaleas have a more compact and reduced habit, both in their vegetative and floral parts. 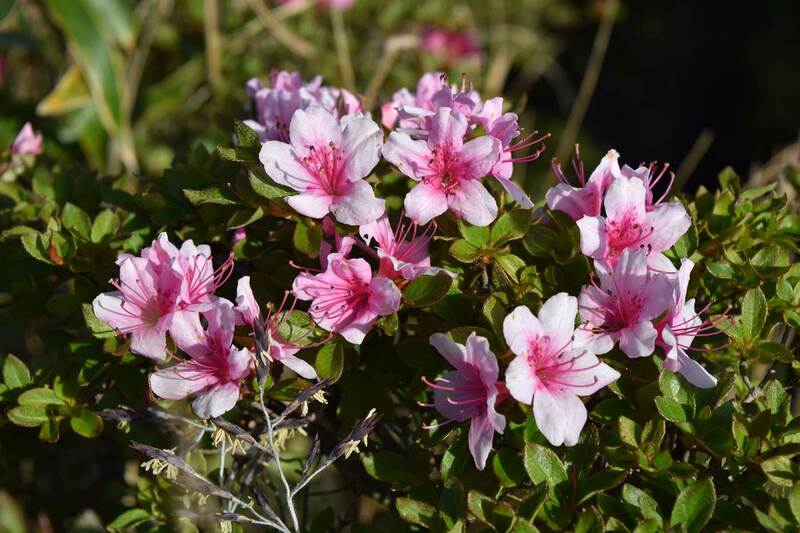 Tsutsuji azaleas can also tolerate strong direct sunlight better. These attributes contributed to make tsutsuji among the constitutional plants of karikomi topiary. That’s all very well, but what is exactly tsutsuji in modern botanical language? Azaleas have been raised for ages by Japanese farmers and gardeners, reaching the peak in the Edo period, the golden age of Japanese horticulture (1603-1868). Genealogies of long-cultivated garden plants are often exceedingly complex. When it comes to the Japanese azaleas then, given the promiscuous tendency of the species to hybridize, worsened by the nebulous records in historical literature, one can prefigure how simple will be to unravel the question. So I consulted the authors who tackled the puzzle, specifically the Japanese botanists Hara and Ohwi, as well the great westerns Wilson, Ingram and Creech. They all agreed that the tsutsuji race derived from Rhododendron x obtusum, a mysterious garden hybrid that doesn’t exist in nature. The primary question was then different: 1) which are the natural parent species of Rhododendron x obtusum? 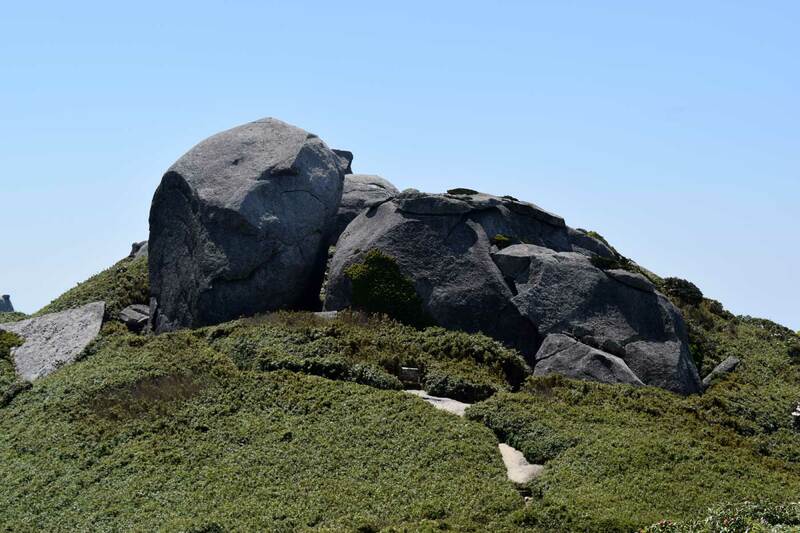 Also, 2) what is their wild location(s)? Let’s start from the second question. 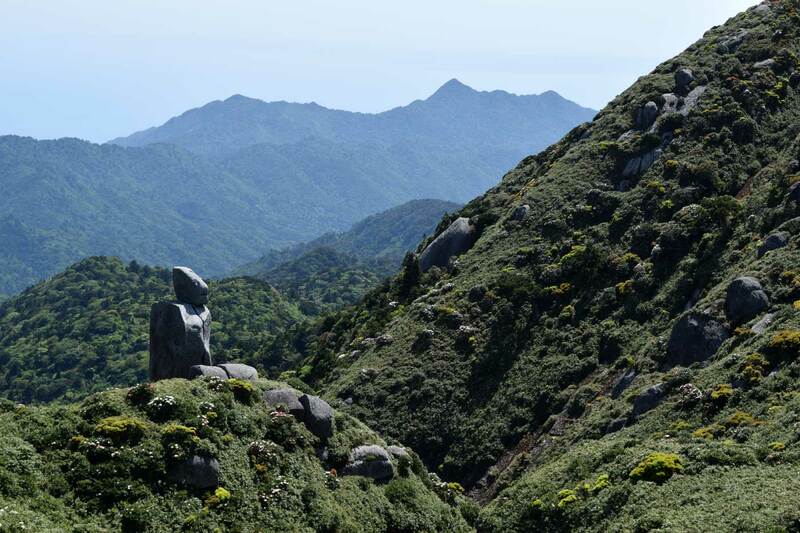 All the above-mentioned authors suggested the mountain ranges of Kirishima, Sakurajima and Takakuma (all in Kagoshima Prefecture in southern Kyushu) as initial centers of distribution. Among these though, Kirishima has been traditionally the most largely supported in literature. At least two good reasons exist. The first has to do with the species population and distribution: I’ll get there soon. The second concerns the connection of Kirishima with the Japanese mythology, and the connection of such mythology with the horticultural history. To make a long story short, the ancient deities of Japan are said to have come down from this peak to conquer the terrestrial world. Therefore, sacred pilgrimages have long been made here and plants brought back as souvenirs. 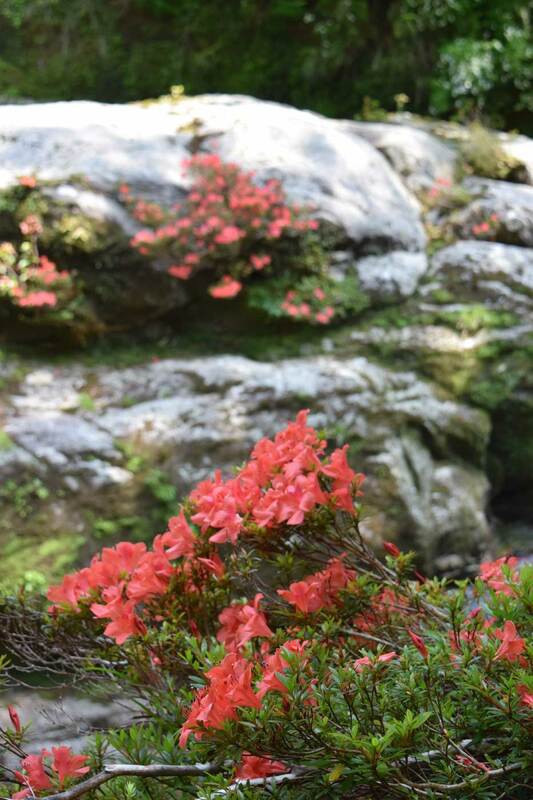 From these votive plants, the first stocks of tsutsuji azaleas were very likely to derive. Getting back to the first reason, Kirishima houses the two species that are major candidates as the prototypes of R. x obtusum. These are R. kaempferi and R. kiusianum, the latter being endemic of the mountain. All these facts (plus the idea of a bit of mountainous trekking to escape the looming heat of the urban planes) seemed to me pretty good reasons to go and have a look. From the car window the Kirishima Mountains stood like stone giants on the vast volcanic Ebinokogen Plateau. 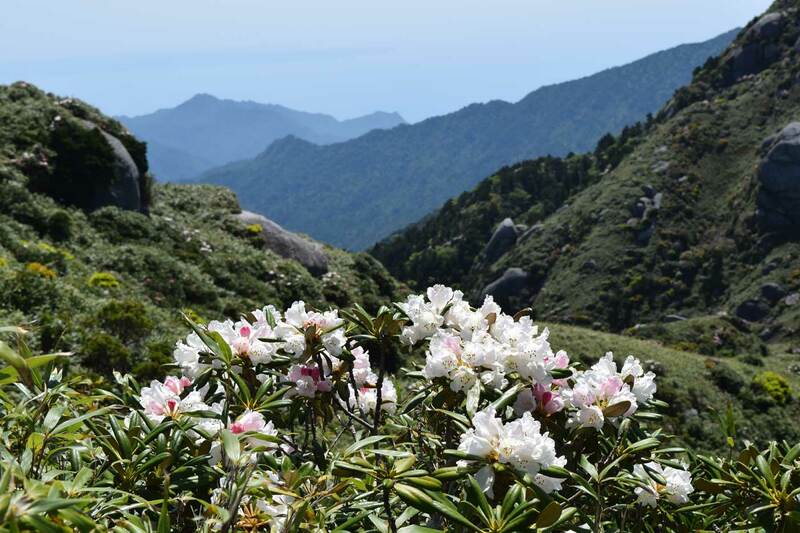 These are the highest peaks in southern Kyushu (1700 m), no wonder – I thought – they are considered the Olympus of Japanese cosmogony. When I finally arrived at the trailhead at 1200 m, I found out that the main trail to Mount Karakunidake was closed due to volcanic activity. Sulphur smoke was rising everywhere from the mountain slides and ridges. Something was brewing there, but timing did not seem to be on my side. I had to ask to the local guides at the near Ebino Eco Museum Center, who suggested an alternative route. Here I also discovered that the Vulcan Shimmoe-dake erupted six years ago, after 300 years of dormancy. (So, I could have definitely been more unlucky…) The vegetation didn’t seem to enjoy the pyrotechnic party: the colourful display that was given to the eyes of previous plant explorers was today not available for me. 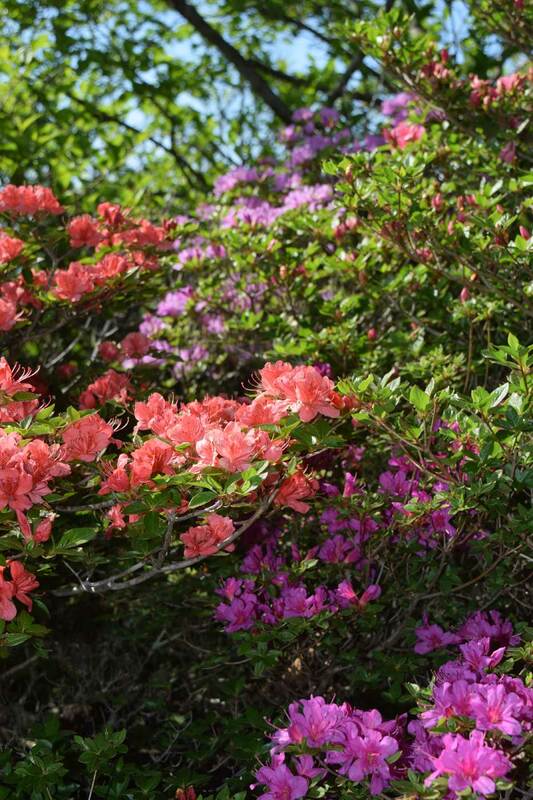 Creech writes that azaleas created here “thickets through which one must force his way” (Creech, 1961). That scenery is currently in a phase of reconstruction. I spent some time reading the museum’s didactic panels, mentally warming up for the hike. The key for understanding the mountain’s floral composition lays in the ecological succession of a habitat prone to volcanic damage. After volcanic eruptions and consequent plant destruction, the barren ground is colonized by pioneer plants, especially grasses and sedges. Subsequently, ligneous plants penetrate the environment changed by the pioneers: this is when azaleas enter into the equation, followed by Pinus densiflora (on stabilized soil) and Abies firma (on vulnerable soil). Finally the vegetation goes back to a climax state with the ascension of subarctic species such as Quercus mongolica and Fagus crenata (above 1200 m), and in lower zones Tsuga sieboldii, Distylium racemosum, Castanopsis sieboldii and hybridizing oaks (Quercus stenophylla, Q. gilva and Q. salicina). Some other did-you-know facts described concerned the figures of annual precipitation (an outstanding 4400 mm, which is three times more than Tokyo, that is three times London), and the interesting case of Betula maximowicziana, a cool-temperate birch now native to Hokkaido, but once present in the southern islands too; after the glacial ages, the plant disappeared from Kyushu, but found refuge in these mountains. Repeating to myself these and other natural facts, I hiked throughout the forest, and after about three hours finally reached the summit of Karakuni-dake (1700 m). From that altitude a good view was offered of the surrounding landscape. Around me was an incredible museum of craters. To the south-east the barren surface of Vulcan Shimmoe-dake was visible, which erupted in January 2011. The orography was dramatically bent and busted: it was as if baby giants had fun playing a sand marble race. Below the line of the bare alpine tops of Karakuni-dake, the windswept grassland of dwarf bamboo Pseudosasa owatarii waved in the elements. I was too early to spot the beautiful campanulate flowers of the dwarf forms of Pieris japonica. 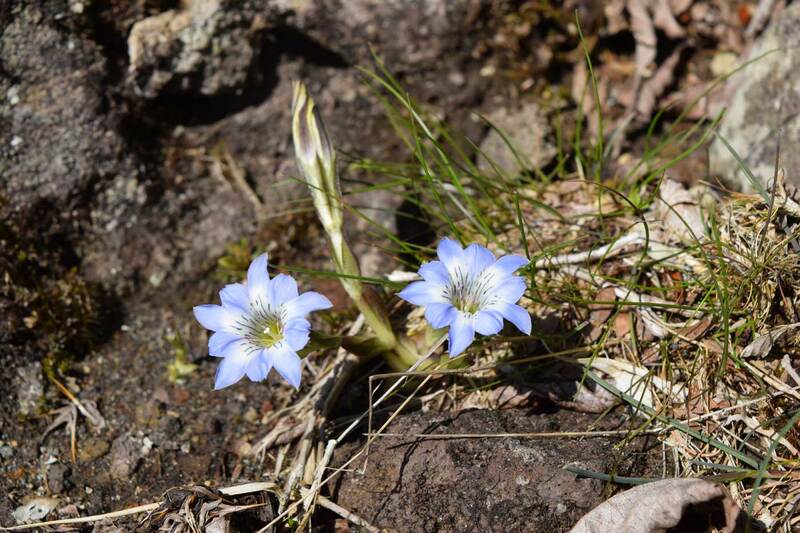 However, Gentiana thunbergii accompanied my steps with its charming blue bells. It was in such a vaguely selenic landscape that I encountered the first target of my mission: Rhododendron kiusianum, a diminutive azalea occurring in heath-like colonies at the rim of this volcanic cone down to 1700 m. R. kiusianum had a very compact, almost sheared habit, remarkably hugging the smallest rocks and crevices. Everything was diminutive in it: from foliage to flowers, from branching to ultimate stature. The flowers were light purple, sometimes pink. As the guides warned me at the eco-museum, the plants were a bit late this year (full bloom is usually expected in the weeks between May and June). Only a few bushes were in flower for me. I am still not sure about the exact cause of that unlucky delay. Probably it has to be found in the very mild winter we had in Kyushu this year. For that reason at least, the cherries were quite late (in many southern regions almost didn’t flower at all), but I don’t have available a temperature record of the peaks of Kirishima. 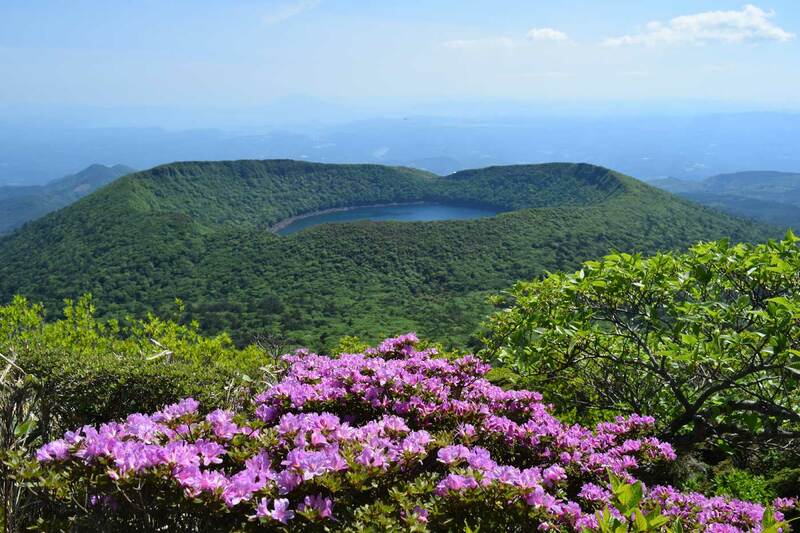 On the way back I took a detour to Lake Ōnami, a large crater tarn situated at 1412 m. Crossing the valley between the two craters I found myself in a scrub populated with some of the most staggering flowering trees and shrubs of southern Japan. Once again, not much was in flower for me (apart from the white racemes of the ever-present Symplocos lucida, as well as the light purple flowers of Rhododendron nudipes, a rather common arboreal azalea here), but I recognised leaves and barks of Hamamelis japonica, Lindera triloba, Viburnum furcatum, Corylopsis glabrescens, Magnolia sieboldii, Cornus kousa and Stewartia pseudocamellia. Most unfortunately of all, I missed by only a couple of weeks the inflorescence of Malus spontanea, perhaps the most sensational specialty of Kirishima (after the azaleas, of course). This is a rare endemic crab apple up to 3 to 5 meters, with red buds opening in pale pink blossoms. The flowering time only lasts ten days in the first half of May, so I guess I have to come back next year. It was also too early for the flowers and berries of Vaccinium bracteatum, which is very diffused on Japanese altitudes but still managed to escape my investigations. At around 1100 m, while approaching the large volcanic boulders at the rim of the crates of Lake Ōnami, I encountered the second target of my expedition. A multi-coloured, polymorphic swarm of azaleas started appearing, taking place progressively. Their rather social population showed extreme variability, in size as well as in colouration. A bewildering array of pink, scarlet, crimson, purple was offered to my eyes: it was really, really remarkable. These were the famed “Kirishima intermediates”, the natural hybrids between R. kiusianum and R. kaempferi of lower altitudes, bridging (or “blurring”, according to Ernest H. Wilson) the boundary between the two species. In their DNA a possible answer can be traced to the question about the mysterious parentage of R. x obtusum. 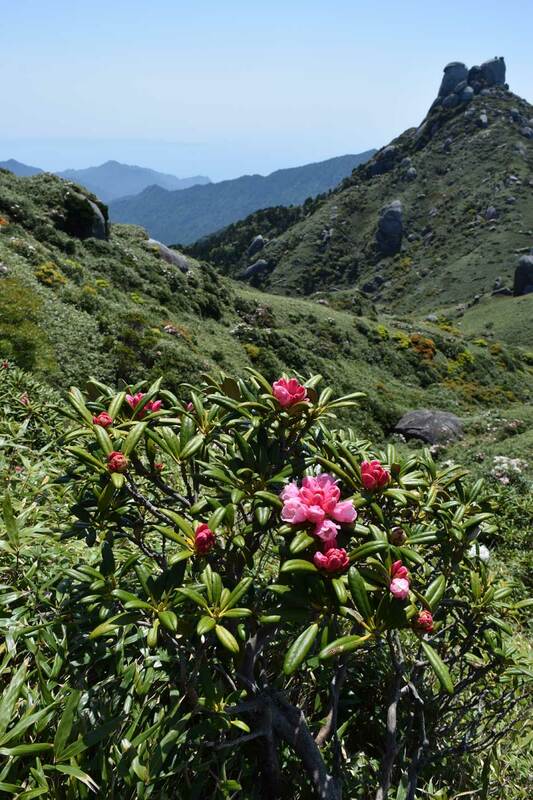 Rhododendron kampferi is probably the most distributed and variable rhododendron species in Japan. It is distinguished by its loose upright habit, flat elliptic leaves and orange to brick red flowers. 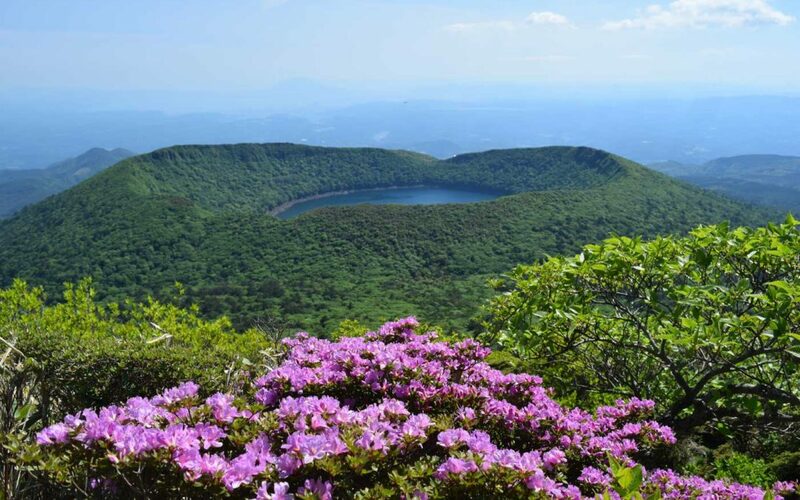 It is a tall, evergreen azalea, growing up to 800 m. When driving close to the onsen resorts which dotted these mountain ranges, one can sometimes spot this azalea growing next to the volcanic small sulphurous eruptions and rivulets of warm water, bathed in warm steam. From the bewildering “intermediates” derive the tsutsuji azaleas, the most important selections of which are the celebrated Kurume azaleas. They became known in the West through the expeditions of Ernest H. Wilson, who famously selected 50 cultivars in Kurume (central Kyushu) for import to the USA via Arnold Arboretum. The lineage of the kurumes remains a little bit of a mysterious mix though. Together with R. kiusianum and R. kampferi, R. sataense (from the Takakuma Mountains, near Kanoya) it is sometimes taken as a possible candidate. To add excitement, more species were recently brought into the equation (Okamoto et al., 2007). While my hunt for the (supposed) prototypes of the tsutsuji was largely premeditated, the encounter with the satsuki azaleas happened somewhat fortuitously. Indeed I was again looking for rhododendrons, but not specifically the parent of the satsuki, aka Rhododendron indicum. Later I convinced myself that that find was probably just a matter of time nevertheless: R. indicum has a rather widespread distribution, growing natively in central and southern Japan typically by the sides of rock-strewn streams up to mountain peaks. (Interestingly both Wilson and Creech agreed in localizing its epicenter in Yakushima). If it falls in one’s sight during the (very long) flowering season, it would be imperative to stop, admiring the undeniable ornamental value. Which is precisely what happened to me. The weekend after Kirishima I travelled to the island of Yakushima, a botanical paradise situated 60 km south of Kagoshima. 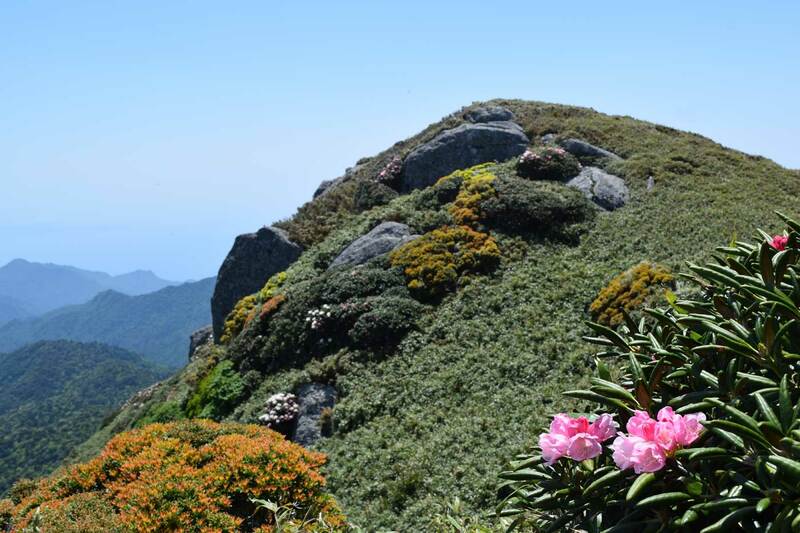 My declared intent was to hike up to the mountain summits to observe the famed Rhododendron yakushimanum, an almost-perfect lepidote rhododendron endemic to the island. This was done successfully on the first day of my stay, as I will describe later in this article. The next and last day on the isle I decided to stretch my legs in a bit less demanding hike. I went to Shiratani Unsuikyo, an atmospheric forest ravine (600 to 1200 m) which is famous in Japan for having inspired the animated film Princess Mononoke, with its scenery of ancient cedars and carpets of ferns and moss, the site’s real landmark. Unfortunately at the time of my visit it wasn’t moss season yet, as it really takes over only after the rainy season (June’s last two weeks and July’s first week). My intention was primarily recreational or – using the Japanese designation – shinrin-joki, the “immersion in the forest” with the goal of purifying body and soul. After just a two minute walk from the car park, all my resolutions of a mindless stroll had already broken down. On the large boulders and the eroded walls of the ravine the sight was given of spectacular colonies of flowering wild rhododendrons. Blazes of deep orange ignited the granite surfaces, like lapillus from a volcano. Their incandescence was not going to be ephemeral. They would stay in flower well into the end of summer. I was standing before the altar of Rhododendron indicum. Two qualities were perceivable at the very first glance: the first, a natural generosity of flowers; the second, a tenacious root system, capable to hug the ground closely and grasp in the narrowest crevices. Moreover, the plants were adorned with compact and shiny foliage, seemingly stealing its reflections from the clear spring water below. Needless to say, all these virtues were the reason for the great ornamental fortune of R. indicum. 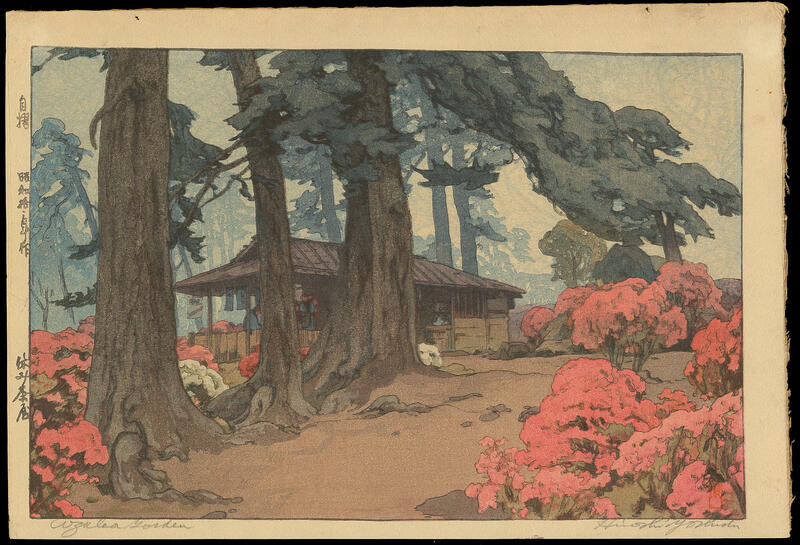 From time immemorial, farmers brought wild specimens down from the mountains to the nurseries, progressively developing the evergreen satsuki azaleas of the Japanese gardens. Satsuki selections withstand transplanting, pruning and pollution admirably, making them the ideal choice for landscaping and traditional karikomi topiary. The fine proportions and branching also determined their use for bonsai. Some authors involve a second species in the DNA mix of satsuki azaleas. This is Rhododendron eriocarpum, an allied species from the adjacent island Kuchinoerabu. However, it is safe to say that the parentage of the satsuki azaleas appears to be much less nebulous than the kurumes. R. indicum (the first-known of all Asiatic azaleas, and – coincidentally – the type species of the subgenus Tsutsusi) is with no doubt first parent of satsuki. Floristically speaking, satsuki azaleas have larger inflorescences and a later, longer flowering season. This makes them useful in terms of garden design. Satsuki bloom from May into July, when most of the other azaleas are gone. Moreover, they are available in single, hose-in-hose and double flower forms, with a truly kaleidoscopic multitude of different colours and patterns. Wilson and Creech praised tsutsuji selections most (especially the ones from Kurume). On the other hand, the Japanese gardeners seem to be particularly fond of satsuki azaleas. Ultimately the two groups share a very similar morphology; what really discriminates them is the different phenology, and the consequent different usage for the garden and landscape purposes. I had to go and pay my respect to these plants. 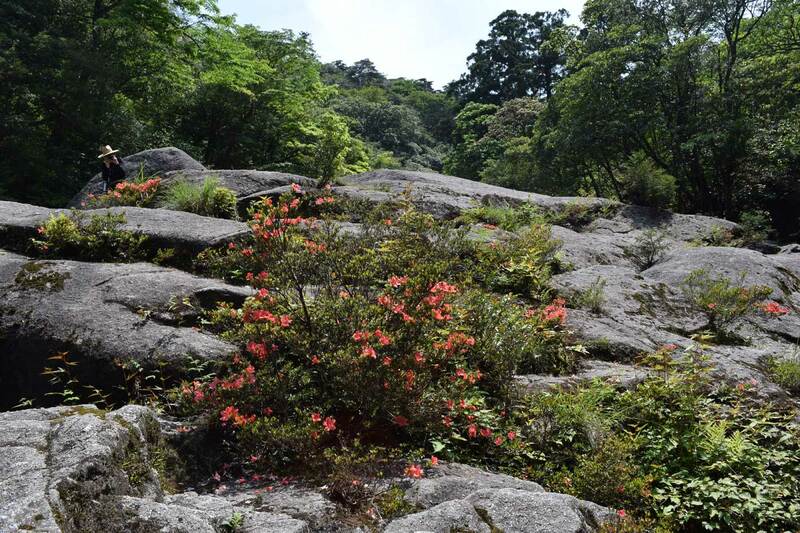 My hike started at the Yodogawa Mountain trail entrance, situated at 1360 m. For the first part of my ascension, the most noticeable trees in flower were Symplocos paniculata and Rhododendron nudipes, the arboreal azalea which accompanied my hike in Kirishima the week before. At around 1630 m, the forest scrub suddenly opened as I found myself walking in an alpine marshland. It was a really unexpected landscape: skeleton trees of Cryptomeria japonica – with mutilated branches and dramatically scarred and bleached trunks – sinisterly towered above the peat marshes punctuated by swarms of dragonflies. This rather unique habitat (the higher in altitude in southern Japan) is locally called hana-no-ego, which means “flowering swamp”. No surprise that, around the small pools and between the sphagnum moss, a multitude of spectacular plants (some endemic) find their natural home. Just to mention a few: Buxus microphylla var. riparia, Eurya yakushimensis (displaying the most beautiful pink-stripped petals and bluish bracts), Juniper chinensis var. sargentii, Pieris japonica and Viola verecunda var. yakushimana, perhaps the real signature plant of the marshland. Unfortunately the natural conditions promote not only a wonderful floristic specialism, but also are a pretty ideal ecological habitat for mosquitoes. Thus, I was forced to continue my ascension, taking shelter in the subalpine scrub forest above. Here, once again, the Japanese mountain flora was ready to give me a demonstration of its prodigious diversity. Among the woody species, I could recognise Cornus kousa, Clethra barbinervis, Juniper chinensis var. sargentii, Cryptomeria japonica, Buxus microphylla, Eurya japonica, Osmanthus heterophyllus and Rhododendron keiskei (a pale yellow flowering arboreal azalea). Many of these species belong to cool temperate zones and find here their southernmost limit in Japan. And the most exquisite flowers of those fields were those of Rhododendron yakushimanum. The landscape was simply glorified by the flushes of deep pink buds and white petals. It was the living demonstration of my thesis, that rhododendrons can compete and play the part of the noble roses. All the other plants seemed to be not more than mere beneficiaries in the rhododendron garden. The dwarf bamboo Pseudosasa owatarii and the narrow-leaved Miscanthus sp. were the matrix for the rhododendron planting. Similarly, the pale green and orange islands of dwarf Pieris japonica, or the deep green of Juniper chinensis var. sargentii were only supporting cast. (Wikstroemia kudoi – syn. Daphnimorpha kudoi – is less abundant, but it is definitely worthy for a return trip here in July). Let’s inspect a bit more scientifically our leading lady. Rhododendron yakushimanum (Hymenanthes subgenera, Pontica subsection) is an evergreen, elepidote species, growing to 1 m. (Some literature states up to 2.5 m, but personally I didn’t see such height.) Inflorescence is typically very generous, showing a natural variability between pink and white. The small flowers are with stiff and waxy, having a pentamerous corolla and ten stamens. The light green spots on the throat are a common mark with the close R. degronianum. The indumentum is attractive too, darkening to tawny brown. Moreover, the plants show a great resistance to pests and diseases, together with a remarkable tolerance of full sun. Creech compared its morphology with that of R. pseudochrysanthum, which he observed at the summit of Mt. Morrison in Taiwan. However, the genetically-closer species is R. degronianum (syn. R. metternichii). In fact, R. yakushimanum is known in Japan under the name R. metternichii var. 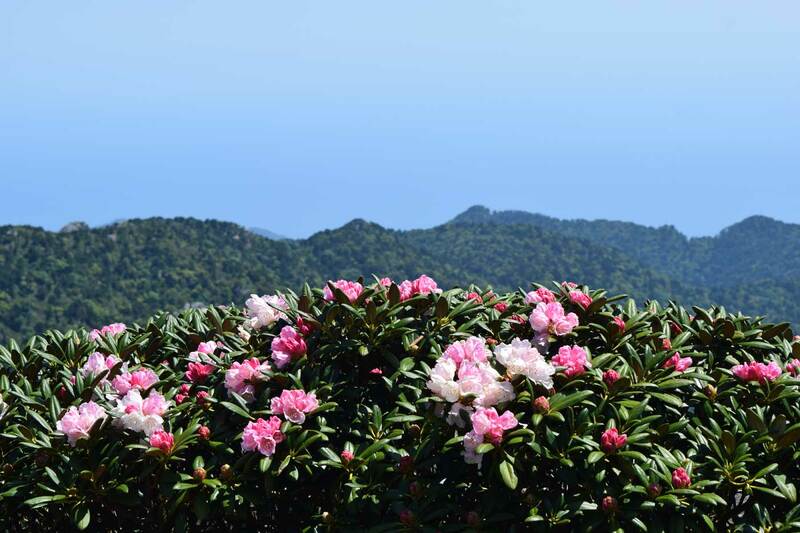 yakushimanum, with which name it is labelled in the Yakushima botanical gardens, and also described in Ohwi’s Flora of Japan. 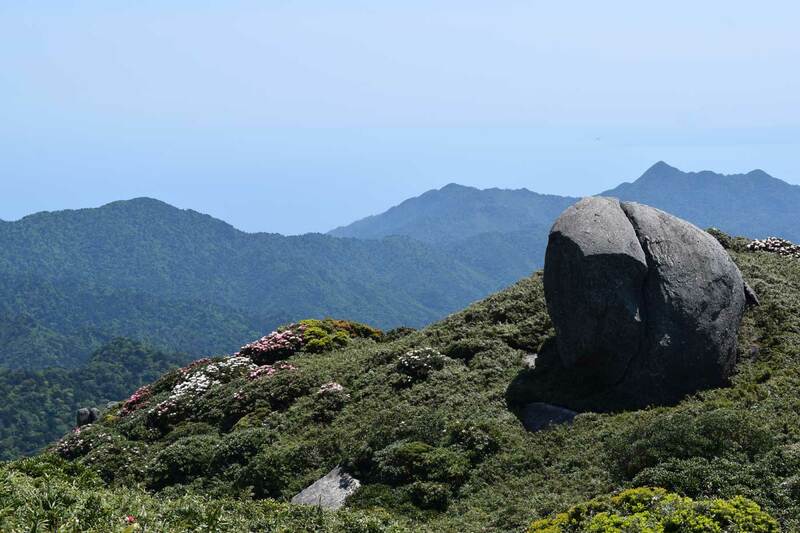 According to the same author, the Yakushima variety has a thicker tomentum in the leaves, pedicels and ovary. On the other part of the hemisphere, the plant is usually referred as R. degronianum ssp. yakushimanum (Carrìere, 1986) or straightly R. yakushimanum (Nakai, the RHS, James Cullen and most literature). However, all those taxa are still unresolved for the PlantList (together with the other nebulous island’s endemic forms, such as R. yakuinsulare, yakushimense and yakumontanum). The species was first scientifically described in 1921. In the 1934 it was introduced in the UK, after Lionel de Rothschild requested plants to Koichiro Wada, a Japanese nurseryman. It achieved great popularity in 1947, when a clone of ‘Koichiro Wada’ was awarded a First Class Certificate. (Last year, the same cultivar was voted Rhododendron of the Centenary by the RHS Rhododendron and Camellia Group.) From the 50’s, the selections of R. yakushimanum (or “yaks”, as they are known in the nursery industry) became the top-of-the-line in rhododendron breeding programmes in Britain and the USA. No doubt these selections are very good plants, showing compact habit, sun-tolerance, generous flowering, etc. In the year 2006, 28 RHS Awards of Garden Merit were achieved by R. yakushimanum..
Ohwi, J. (1965). Flora of Japan. Okamoto, A. et al. (2007). Breeding and Production of Kurume Azaleas (Rhododendron obtusum Planch.). Tsukamoto Y. et al. (2015). Japanese Horticulture. Origins and History. Wilson E.H. et al. (1921). A Monograph of Azaleas. Rhododendron Subgenus Anthodendron.